I love the 4th of July and the celebrating of our independence marked by patriotic displays, sales, and outdoor activities. I enjoy the day at the beach with my family, hosting or attending a barbecue, and waiting for the fireworks. Though I appreciate the patriotic spirit, I do not like to dress literally for it. You will not find me in an all stars and stripes outfit or any kind of t-shirt or pant decorated with an american flag on it (sorry it’s just not how I roll). I will, however, incorporate red, white or blue (and sophisticated stripes) into my outfit for a cool and fashionable 4th of July outfit. 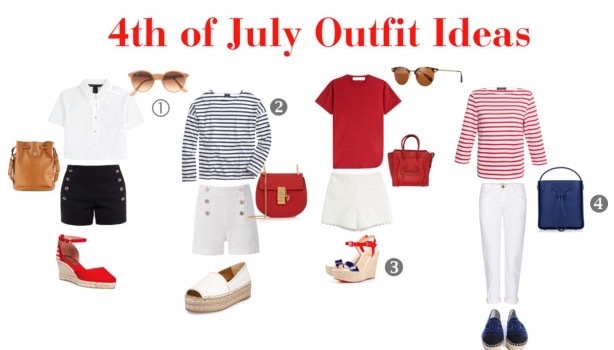 Here is some inspiration to get you looking “patriotic chic” for the 4th. 1. J.Crew Ray-ban high street round sunglasses – $200. Love this classic pair of round sunglasses that look very retro but are made sleeker and more modern. An instant update to any look. 2. Saint James for J.Crew slouchy tee – $120. Not only is this a great top to wear on the 4th of July, but this top should be a staple in every woman’s summer wardrobe. It’s an easy tee to wear made out of cotton (it washes really well). It has a roomy body and a slim sleeve. Oh—did I tell you it’s made in France! So chic and Coco Chanel would approve! 3. Christian Louboutin Spachica Patent Leather Sandals- $675. These are the BOMB! What’s not to like for the 4th of July — color is navy & red. If you have the budget for these wedges, I believe they will not disappoint. They are really smart looking and guaranteed to turn heads! 4. 3.1 Phillip Lim Soleil Small bucket bag – $895. – I love this bucket bag—the leather is really soft and for a small bucket bag it’s pretty roomy. Barney’s (NYC) has it in many colors. —Worth a look or a purchase! Previous Post It’s all about the espadrille! Next Post Get Your Fall On !